That's how much Safiyyah Cotton makes working at a McDonald's in Philadelphia. While her work schedule changes often and she wishes she could work full-time, Safiyyah typically works 20 hours a week and brings home about $240 every two weeks. As a single mom, it's barely enough to support her and her one year-old son, Safi. 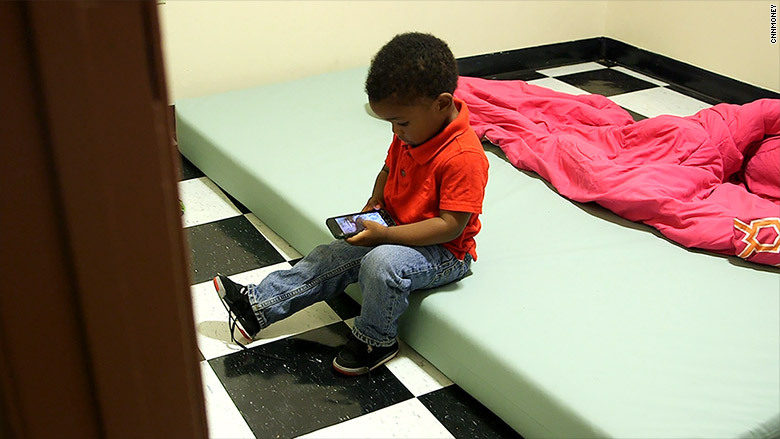 Safi's father is incarcerated, and Safiyyah's paycheck is their only source of income. So how does she get by? It takes a lot of penny-pinching, borrowing from friends and family, and sacrifice. Plus, Safiyyah gets considerable help from the government through benefits for food, child care, rent, and health care. Here's a look at how she stretches her monthly budget. 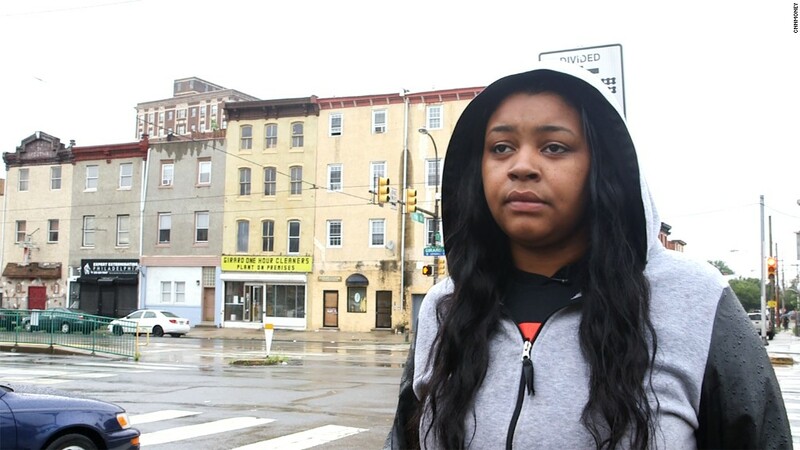 Safiyyah lives in a two-bedroom townhouse with her sister in North Philadelphia. 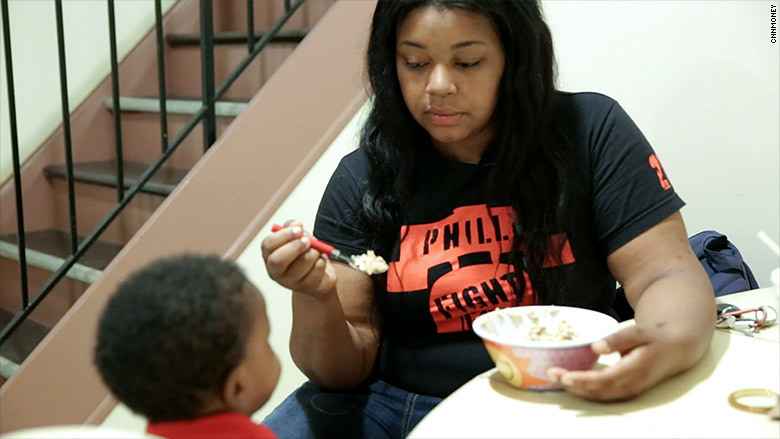 They each pay $220 a month, with the government covering the remaining $125 through the Philadelphia Housing Authority and HUD's Section 8 housing assistance program. "My number one always is to make sure that my rent is paid so I make sure we have somewhere to live," she said. Prioritizing her rent bill means wiping out most of her first paycheck of the month. During her pregnancy, she ended up in a shelter. She is desperate to keep that from happening again. She also covers her gas and electricity bill, which is roughly $40 a month. She keeps that low by keeping lights off and constantly unplugging everything. Safiyyah pays a co-pay of $10 a week, or $40 a month, for Safi to receive day care five days a week. Child Care Information Services of Philadelphia covers the rest, using funds from the Child Care Development and Block Grant Fund. Without government help, her child care would cost $150 a week, or $600 a month -- far more than her entire monthly income. Even though her co-pay is small, Safiyyah is several weeks behind on her day care bills. 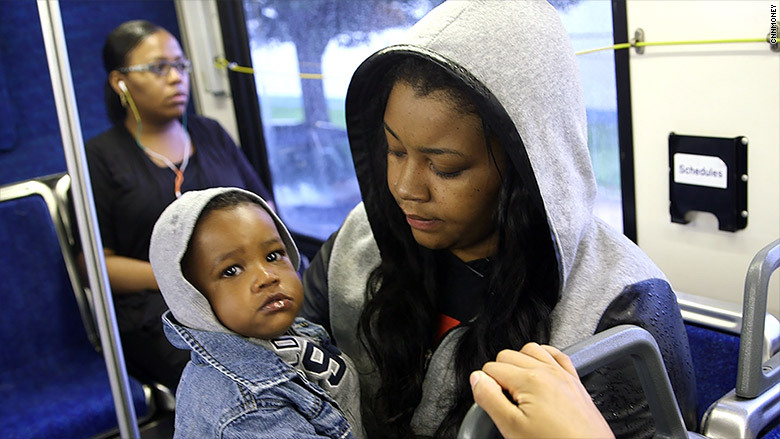 Safiyyah uses SNAP benefits, or food stamps, to get her and her son through the month. She previously received $261 in food stamps every month. That number has recently been reduced to $216 a month. 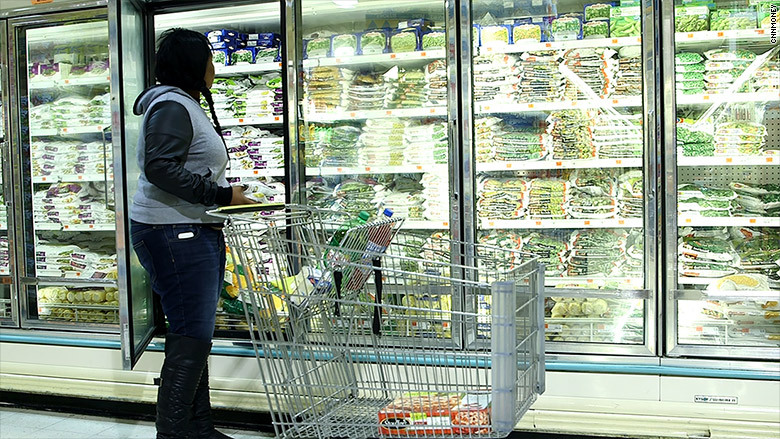 To make that money last, she buys in bulk and sticks to frozen foods. "I don't buy fresh fruits and stuff like that because it's not guaranteed that it will be eaten all in the couple of days that it will stay fresh," she said. Safiyyah also often skips lunch to save money, but she says she always makes sure her son doesn't go hungry. Safiyyah pays her cell phone bill herself, which costs about $100 a month. That's a huge chunk of her income, and she rarely pays it on time. Instead, Safiyyah says she files a two week extension every month, and then puts money towards her balance only when she has to. But the phone is absolutely essential, she says. It's what she uses to call in to find out her work schedule, check in with Safi's day care, and stay in touch with friends and family. And in her home, there's no television. There's no computer. Safi has very few toys. Her phone fills those gaps. Safiyyah gets health care through a Health Partners Medicaid plan. She says the coverage is good for Safi, but very limited for her. For that reason, she says she avoids going to the doctor. "If I need to go or I have no other choice to go, I'll go. But if it's something I can cure at home with Tylenol or something, I won't spend the $30 to go see a doctor when I can find some remedies online or something just to save money," she said. Recently, Safiyyah needed a root canal. But she couldn't afford the out-of-pocket cost, which she says would have been $300. She was told she could get her tooth pulled for free instead. Seeing no other solution to the pain, she decided to have the tooth taken out. At the end of the month, Safiyyah is often running at a deficit. "One of my checks was $238 and it was the week rent was due. My part of the rent is $220. So it was like I paid the rent. I had no other choice. But then I find myself borrowing and borrowing." 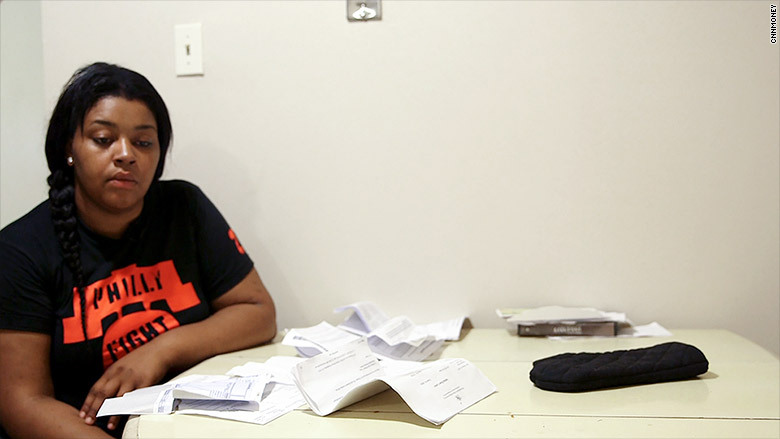 She is past due on her gas bill, her son's day care co-pay, and her cell phone bill. But she says it could be much worse. "If I wasn't getting rent assistance, food stamps or child care help, I think I would still be living in the shelter," she said.